The unrelenting curse of Hulme, inner city district of Manchester, is that it is forever being pulled down. Constantly returning to rubble and growing up out of the ashes again and again with new ideologies. It is a temporal district, where the architecture moves with the coming of age of its residents. As the children grow up and flee the nest, the nest disappears. Where one expects to be outlived by the permanence of stone, brick and morter, those in Hulme seem to survive their homes. The deceased buildings haunt the streets, rather than the dead. Hulme originally served the mill and factory workers of industrial Manchester. In the 19th Century it was rows and rows of terraced houses. Hundreds of thousands of workers powering the first industrial revolution. Hulme was a stable for the first mass-manufacturing class, placing workers within walking distance of their factories. The thousands of identical homes reflected much of the city; as thousands of people started the 19th Century phenomenon of emigrating from countryside to city the streets filled to capacity and beyond. The red brick terraces became synonymous with the British working class, of hardship and reality. It was a area of Engel’s Condition of the Working Class, where cholera, whooping cough and other diseases took hold, choking its residents. In 1934 the area was declared unfit for human habitation and began its first journey into the dust. 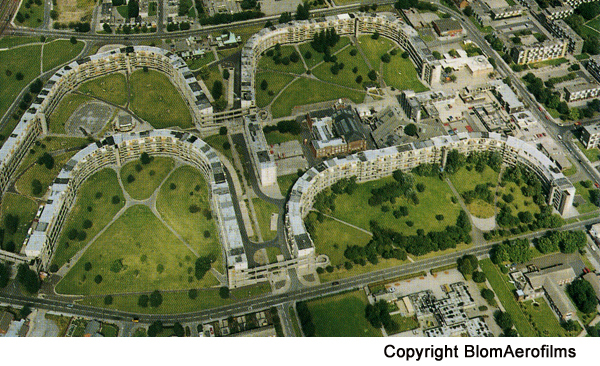 Hulme was slowly un-built through the mid 20th Century, and brutalist concrete came to replace the bricks. 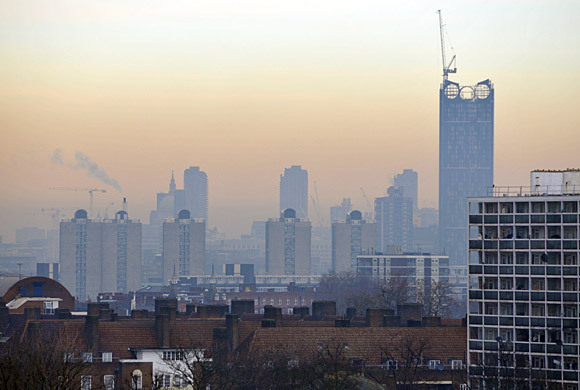 High rises sprung out of the ground, and the biggest public housing project in Europe was born. The project sought to house 13,000 people and was completed in the early 1970’s. The Crescents were designed by Hugh Wilson and Lewis Womersley, taking inspiration from Georgian crescents in Bath. Around the time of the Crescents construction shops on the Stretford Road high street began to disappear, and the factories of Dunlop, Gaythorn gas and Rolls Royce had long been forgotten. Hulme was to serve as a mass residential enclave on the outskirts of the city centre. A functional housing area and little else, the Crescents would reflect a new architectural style and provide a vibrant communal and aesthetic experience for the new residents. The glory of the idea faded within a couple of years of their construction. The new Mancunian Way motorway cut off Hulme from the city creating isolation in and via concrete. The quick and cheap construction of the Crescents meant they soon fell into disrepair, the new heating systems failed, and families were soon moved out due the dangerously ill-designed balconies. In fact, the project was abandoned altogether by Manchester City Council and the estate left for dead. The Crescents became isles of their own, framed by motorways, unwanted by the council, they were essentially abandoned buildings. So in came the artists, creatives, punks, homeless, the wondering, criminals and various sub-sectors of society. Graffiti climbing up the walls, there were huge parties and happenings among the crime and degregation. The Crescents even had their own illegal nightclub. The degenerating buildings soon established an identity of their own where abandonment ruled and its citizens made the area their own. They continued to exist in this precarious state, unguarded by the council, slowly falling, open to the inspiration and desolation of their residents, awaiting their inevitable destruction. This destruction arrived in the 90’s. 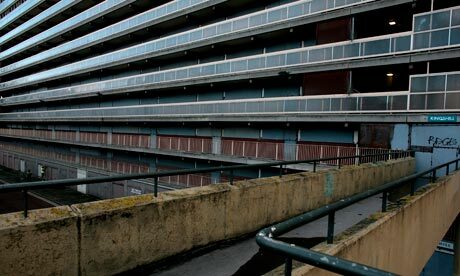 The government supplied Manchester with the money to regenerate the area and slowly to the delight and dismay of many they were knocked down. Manchester in the 90’s was in flux, transforming into a shiny, new, cosmopolitan city. With manufacturing dead it embraced the services revolution and soon found itself caked in glass. The newbuild mentality inevitably found its way into the architectural and identity void that was now Hulme. Manchester City Council found itself daunted by the task of rebuilding a physically and morally derelict area and responded in a typically detached fashion. Emphasis shifted from mass social housing to private enterprise. Planners wanted to create a village-y feel, but created a Ballardesque new town. The post-crescent Hulme project hoped to establish a village like community with vitality and character, but ironically it achieved none of these. The new bricks; the carefully orchestrated spontaneity of housing; the specific spacing of greenery; and the private rents full of students and professional couples sitting behind the primary coloured railings of their tiny balconies inspired a vacuum of identity. The streets were constantly quiet and Hulme in its new form was grayer than ever. Hulme is constantly in flux, and so are its citizens. To be a resident of Hulme in the 20’s had entirely different connotations to being a resident in the 70’s. The architecture can frame its residents, unifying the masses in their unified housing, or likewise, cast one as an outsider in a failed project. Social status has been overturned again and again as perception of the area changes with its buildings. The many outcasts from Hulme’s relentless destruction can find themselves relaying very different streets, different characters, different atmospheres to each other. The impermanence of the area makes its character and occupants unknowable. There is no singular progressive direction for Hulme, it slips and slides backwards and forwards on the tides of higher plans. It is never given the space to grow organically. Today there are more plans for Hulme. A huge student campus is planned for Hulme and once again authorities beyond its borders will force the area into a new unknowable era and leave yet more ghosts in its wake.